**Shadowtrader members enjoy a $100 discount off the Market Profile Mastery Series. This innovative, new course is the most comprehensive program we have ever offered and is designed for people who want to make the most progress in the shortest amount of time. It is an economical, hands-on, virtual learning course with daily mentoring by market expert Jim Dalton. comfort of your own chosen setting, anywhere you are in the world. We offer two Market Profile Mastery Series sessions during the year. You can choose to take one course, or accelerate your learning by taking both courses that — when taken together — will truly transform your trading in 100 days! *Intercession: Intercession is the period of reporting and chat between Course 1 and Course 2. Reporting and chat will continue during Intercession for those traders who are enrolled in both courses. Our best-selling, foundational program will guide you to develop your own market logic and help you gain a perspective that surpasses many of your competitors who primarily use less in depth price-derived systems. You’ll learn Jim Dalton’s top-down-bottom-up approach from A to Z in this comprehensive, instantaneously delivered, six-and-a-half hour video complete with 128-page PDF workbook. He’ll show you how to interpret the market using the Market Profile in conjunction with his bigger picture analysis. Jim Dalton illustrates how to employ market-generated information from various sources all combined with the Market Profile to develop a trading plan perfect for any timeframe — from day trader to swing trader or long-term investors. This approach can be applied to any market financial in nature that has ample liquidity. Everything Jim Dalton could share in a six and half hour video is included on these four videos. The PDF workbook has additional comments from Jim and areas to record your thoughts as you go through the material. This is the perfect trading resource for people who are already familiar with Jim Dalton’s approach and want a more comprehensive view of his trading process, mindset, and hands-on employment of the Market Profile. This over 16-hour training program offers a complete recording of Jim Dalton’s sold-out Chicago seminar. Join Jim as he walks traders through market analysis and preparation on Day One, followed by narration and trading of live markets on Day Two and Day Three. 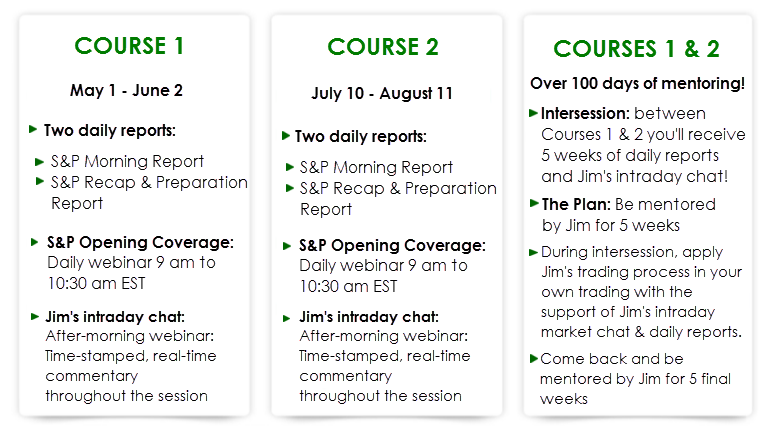 After instruction on the first day, Day Two and Day Three record Jim’s illustration of his methodology using real-time markets that includes reading Market Profile structure and narrating the developing auction for a seminar stock market ending you won’t forget! The final day alone is worth the entire price. At the beginning of the day Jim began the morning session with “This may be a day that opens weak and closes strong.” As the session came into the final hour, Jim asked the audience, “Is anyone still short?” and explained that the market was “dangerously short”. Not long after, within the last hour of the day, the market rallied 400+ Dow points with a dramatic short covering rally. It is the perfect illustration of how Jim uses structure to develop a contextual market perspective. Get ready for an in-depth look at Jim’s approach to the markets and how he formulates his daily perspective and trading plan. This program presents the first day of our Live Markets Seminar Program offering, designed to help you trade with the odds on your side. Jim shares his over 40 years of trading experience, managing an institutional desk, and the wealth of experience he has gained over his career. For product comparisons of our three programs please go to our FAQ page. Get it all and take the fast track to transforming your trading! Order our premium suite and receive all of our offerings for $20% percent savings! That’s $725 off! This ultimate learning package is for those trading thoroughbreds who can’t wait to get right out of the gate, kick start their training and advance their market logic toward becoming Expert. This comprehensive package includes BOTH Market Mastery Courses, our foundational, ‘A to Z’ Field of Vision program as well as Live Markets Seminar. Make the ultimate investment in yourself and your training!